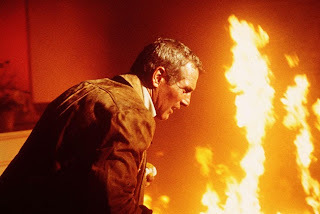 An epic disaster movie, The Towering Inferno is a spectacular, all-star cook-out. With magnificent special effects and a never-ending number of fiery death traps, the film cranks up the temperature and keeps it at a fever pitch. In San Francisco, a gala event is being prepared to open the newest, tallest tower in the world, a building with 138 floors of office and residential space. The building's architect Doug Roberts (Paul Newman) and his fiancée Susan Franklin (Faye Dunaway) attend at the request of the owner, development tycoon James Duncan (William Holden). The dignitaries gathering for the party at the top floor include Senator Gary Parker (Robert Vaughn) and Mayor Robert Ramsay (Jack Collins). The chief electrical contractor Roger Simmons (Richard Chamberlain) is also attending, and he is married to Duncan's daughter Patty (Susan Blakely). Also in the building on opening night are Duncan's public relations chief Dan Bigelow (Robert Wagner), and his lover and secretary Lorrie (Susan Flannery); security chief Harry Jernigan (O. J. Simpson); aging scam artist Harlee Claiborne (Fred Astaire) and his latest mark Lisolette Mueller (Jennifer Jones). Thanks to Simmons' cost-cutting, low quality electrical wiring was installed throughout the building. With all the lights turned on to celebrate opening night, a fire starts on the 81st floor. The fire department responds in full force, under the direction of Chief Michael O’Hallorhan (Steve McQueen). But despite hundreds of firefighters deployed to battle the blaze, the fire spreads quickly through the walls and ceilings, destroying escape routes and trapping Duncan and his guests on the top floor. O'Hallorhan and Roberts have to find ways to battle the inferno and rescue as many people as possible. One of producer Irwin Allen's best disaster extravaganzas, The Towering Inferno is 165 minutes of top quality mindless entertainment. Cramming a dizzying number of movie stars into a building and setting it ablaze is a sure-fire (sorry) way to draw a crowd. And thanks to an endless array of special effects, explosions and stunts, the film delivers. The fire starts early and spreads quickly, there is not much time wasted in talk or prolonged drama. The characters are introduced briskly and in broad strokes, and then left to either burn to a crisp, struggle heroically, or survive. In a rare example of cooperation, 20th Century Fox and Warner Bros. decided to collaborate rather than compete on what had been two separate building-on-fire movies. The result is a script that combined elements from two books, The Tower and The Glass Inferno. 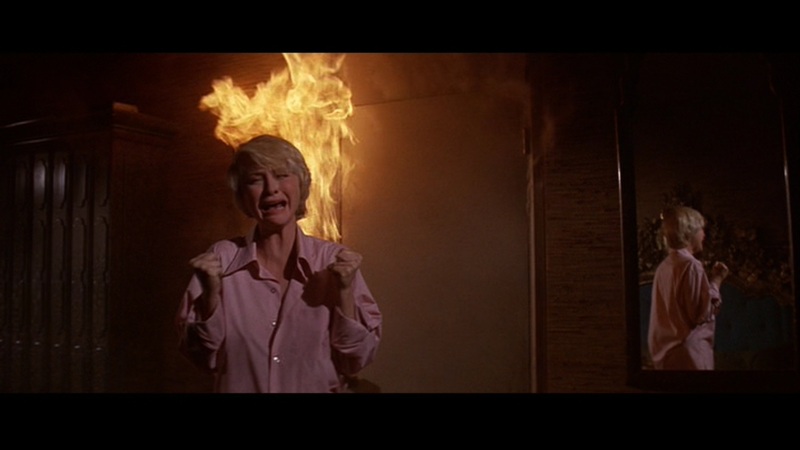 Director John Guillermin keeps the focus on the out-of-control fire, then goes looking for cliff-hangers where characters are trapped by the lapping flames. 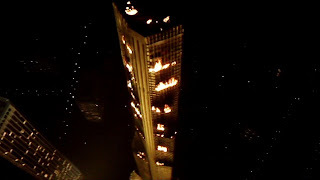 Bigelow and Lorrie are surrounded by the fire in the executive floor after a love-making session; Roberts, Lisolette and a couple of kids are stuck in a collapsed emergency exit staircase; and a whole bunch of folks are trapped in an outside elevator, suspended by a sole cable. And when it's time to thin out the cast and have some characters perish, Guillermin does not blink. 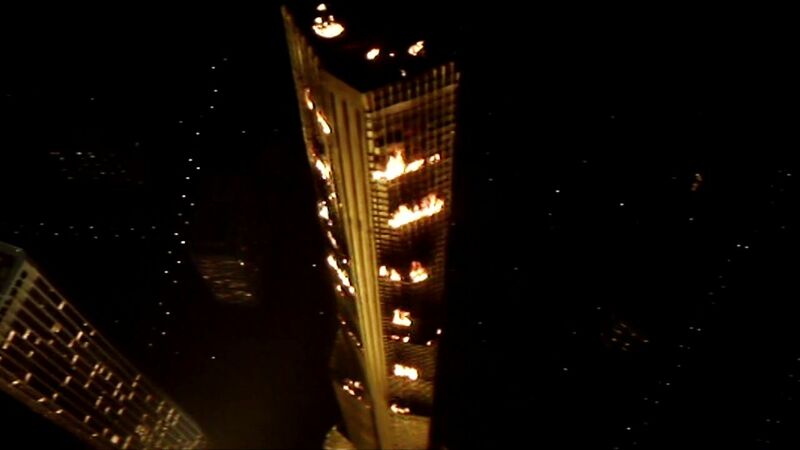 The stuntmen do an excellent job as some characters turn into flaming marshmallows, while quite a few fall spectacularly to their death, either spit out of the building by fiery explosions or victims of malfunctioning rescue pulleys and wobbly external elevators. The talent in front of the camera represented some of the biggest stars of the era. 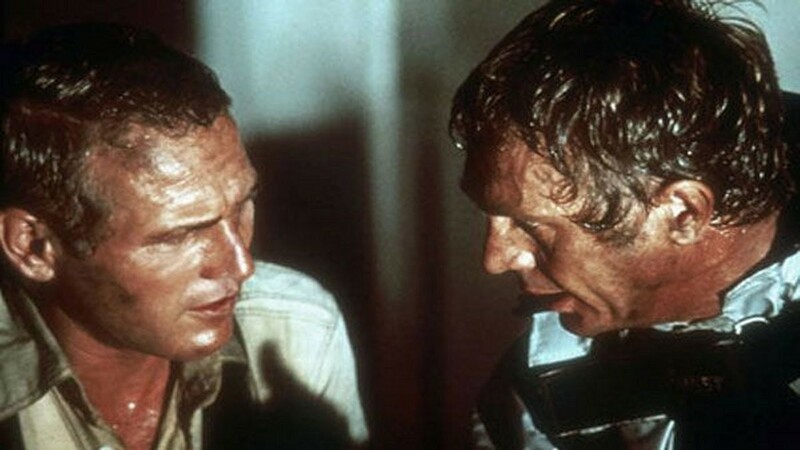 The first and only teaming between McQueen and Newman included the former insisting on the same salary and the same number of lines for the two of them. With McQueen only entering the movie about 45 minutes in, and never being an actor who enjoyed delivering plenty of lines to begin with, this awkward arrangement resulted in more lines than needed for McQueen's O'Hallorhan and some stiff stretches when Newman's Roberts seems strangely untalkative. Although both get to be heroic in the old-fashioned risk-everything-to-save-a-life way, neither seem ever fully comfortable in a movie where acting takes a distant back seat behind the pyrotechnics, with nothing resembling rapport ever developing between them. Meanwhile, in the crowded party room at the top of the tower where the dignitaries are dressed to the nines, tempers start to rise and panic sets in as the seriousness of the situation starts to become apparent and one evacuation route after another is cut off by the fire. William Holden as the host James Duncan tries to maintain a stoic and calm presence as his dream project goes up in smoke. Roger Simmons, the villain of the piece played with perfect I'm A Slimy But Rich Contractor smarm by Richard Chamberlain, eventually reveals his true colours. But apart from Jennifer Jones as Lisolette, the ladies are given not much to do, with Faye Dunaway sleep-walking through the film in a trance despite a fetching dress, while fashion model Susan Blakely as Patty fixes her husband Simmons with the occasional glare, then wonders where her career will go from here (the answer: television!). But ultimately, The Towering Inferno has one objective only, and that is to create an overwhelmingly hot and gripping adventure in a tall burning building. And in that, it is a smoking success.